Whitby Town suffered a second away defeat in three days, going down 2-1 at Hyde United on Monday evening. Dave McTiernan handed the Blues an early lead, but two second-half goals from Ayrton Bevins saw Town beaten by another of their Evo-Stik Premier Division relegation rivals, following Saturday’s reverse at Grantham. “It’s very, very disappointing,” said Seasiders manager Chris Hardy. “These are fine margins, but we got things wrong at both ends. We’ve conceded soft goals and haven’t taken our own chances. Traffic congestion on the M62 saw the Whitby players delayed on their way to Hyde’s Ewen Fields base, only arriving at 8.30pm, meaning that the scheduled 7.45pm kick-off was moved back until 9pm. Boss Hardy refused to blame the late start to proceedings for his side’s defeat, however, but feels that the Blues did suffer some bad luck on the night. “It [the delay] wasn’t ideal for either set of players, so you can’t take anything away from Hyde’s victory,” he added. Whitby took the lead in the 16th minute when Dale Hopson’s corner was spilled by Tigers keeper Sam Vince, and McTiernan pounced to net the loose ball. The Blues had further opportunities to extend their advantage before the break and Mikey Roberts was brought down in the box, but referee Aaron Jackson waved away appeals for what looked a clear penalty. Trailing 1-0 at half-time, Hyde levelled in fortuitous circumstances in the 52nd minute. 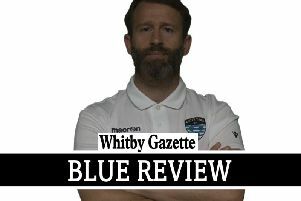 A cross into the Blues box was sliced high into the air by a Whitby man, and as keeper Shane Bland attempted to collect, Bevins knocked him over then fired into an empty net after the ball rebounded to him off the crossbar. The game’s decisive goal arrived 14 minutes later when Laurie Bell’s cross from the right flank was nodded home at the back post by Bevins. Despite two successive defeats, Whitby remain in 19th place in the league table, just a single point above the relegation zone.